Ben Wheatley’s latest feature basically takes one single cinematic motif and turns it into a whole movie. Free Fire is essentially just a big shootout and it is quite quite brilliant.. This same thing has been tried before in the Clive Owen film Shoot ‘Em Up and most recently in John Wick 1 & 2. 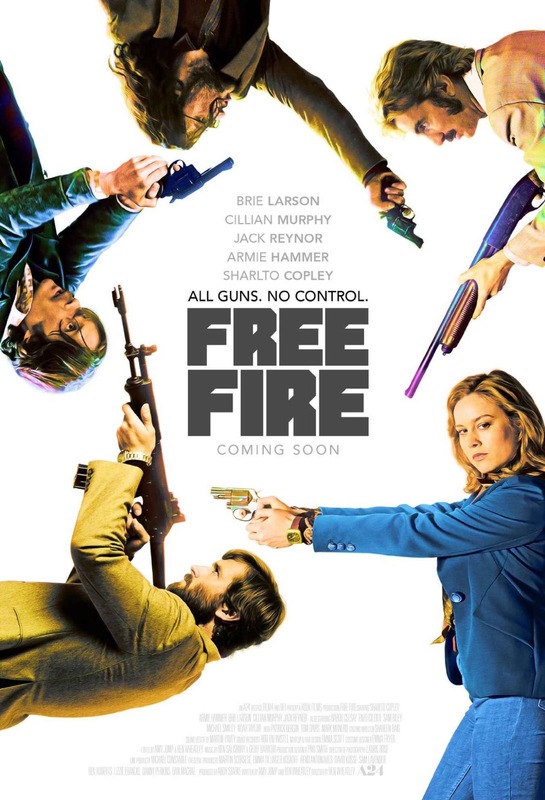 Rather than try to pad the gun play out with a limp narrative as those movies do though (sorry Keanu fans but it’s true) Free Fire surrounds the action with a smart script and brilliantly drawn characters and is so much the better for it. The film is different from these others in the style of the combat too. Wheatley hasn’t treated his fights as a dance (which I am more than happy to admit John Wick does wonderfully) attempting instead to show that when people start releasing hand cannons off at one another it is actually very clumsy and scrappy. None of the shots here neatly finish people off with a well placed hole to the head. The combatants bleed and they crawl around the floor and in most cases it is the same ten people repeatedly taking pops at each other rather than one guy working his way through a tide of assailants like it’s a computer game. For all of this though it is no less choreographed. The direction here is quite astonishing, not in a stylistic way but just due to the sheer logistics of the thing. 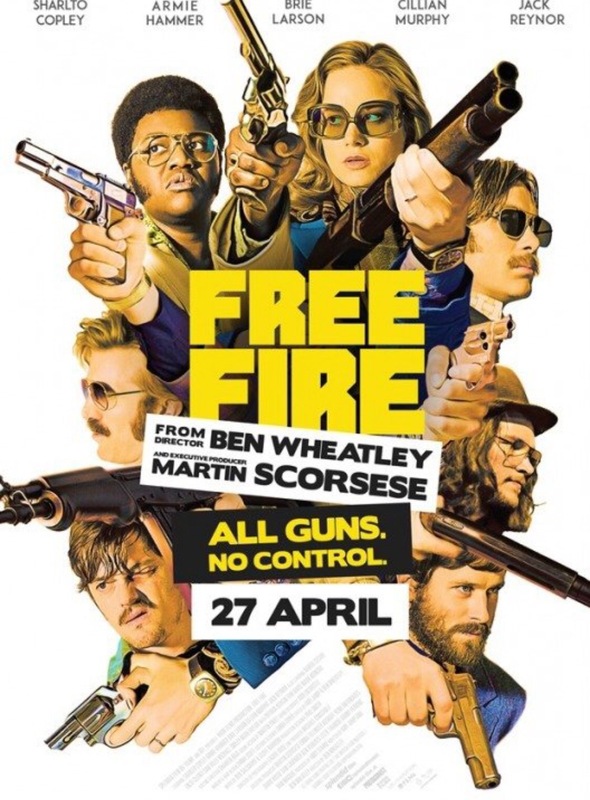 Clearly Free Fire is not going to be everyone’s cup of tea but imagine the shoot out from Heat, staged in the warehouse from Reservoir Dogs with the cast of A Fish Called Wanda. If that sounds like something you could enjoy then head along to see it. The cast are all excellent and play everything with a really dry wit. 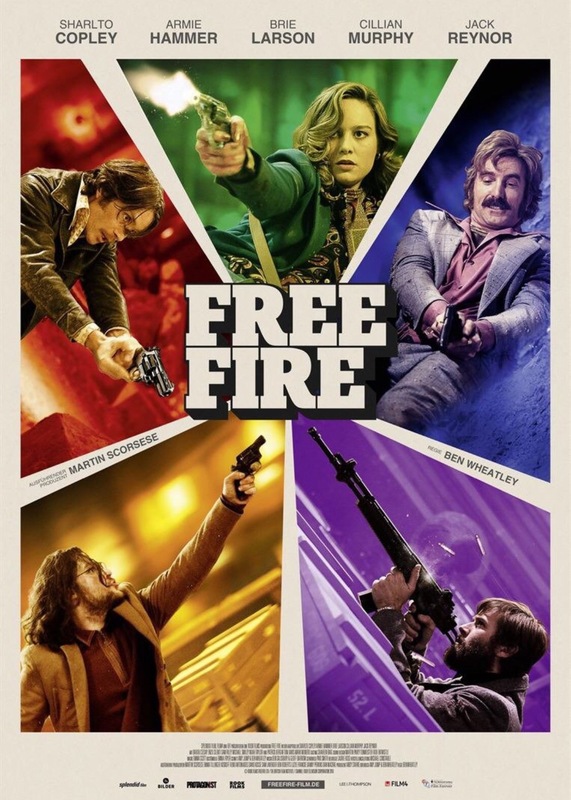 Free Fire is not a broad comedy but it is blackly amusing and some of the characterisations are just the right side of caricature. Sharlto Copley undoubtedly has the biggest personality as extravagant arms dealer Vernon but even though they appear to playing it straighter both Armie Hammer and Babou Ceesay essay very different but equally subtle parodies of the gentleman killer. Jack Reynor is also really strong as the impetuous and stubborn guy that might have kicked the whole thing off. On the other side of the deal gone sour you have Sam Riley, Cillian Murphy and Michael Smiley, each immensely entertaining as a gang with less decorum but a greater sense of honour. The way all these gangsters play off one another, with shaky loyalties and uncertain motives, is great fun. The insults and jibes fly around the room as much as the bullets and it makes for an exhilarating and highly entertaining ninety minutes. In the middle of all of this you also have Brie Larson as the broker who brought everyone together in the first place. Larson’ inclusion in the cast is great. Not just because she is a really good actor (to be fair she doesn’t shine here as much as she did the last time she was trapped inside a single room) but because you wouldn’t normally see a woman in a film of this type, at least not as anything more than a moll. Her role in the film is interesting from a feminist point of view because while she gets to play on a level with the boys there is an inequality of sorts in the treatment of the character, albeit probably an appropriate one. Some of the crims get badly hurt (I’m sure this isn’t a spoiler) and while Larson’s Justine doesn’t go unscathed, the violence against her is distinctively not as bad as that suffered by some. There are clearly things you can’t comfortably do to a woman on screen that you can do to a man. In many respects this is as it should be; any brutality toward women at the hands of men is going to seem misogynistic, particularly because of the historical power imbalance here, but if the playing field is going to be truly level then surely everyone should be able to get liberally, and graphically, shot in the face irrelevant of gender. I had the chance to address this very thing with Ben Wheatley (clang – name drop) as I saw this film on a press pass at the opening night of The Brighton Film Festival and got to talk to him afterwards. He acknowledged the difficulty with screen violence against women for the reasons stated and agreed that while pushing this legitimate boundary would be a tempting challenge, he couldn’t really do so now because others had heard me give him the idea. It is also worth noting that Brie Larson gets prime position on every one of the film’s posters. Possible because the marketers want to appeal to a wider audience and probably as she is now the movie’s biggest star (which wouldn’t have been the case when she was cast). Irrelevant of all of this though this is appropriate as she is a key player and arguably the lynchpin of the entire plot. Not only is she in this boy’s film but she owns it. 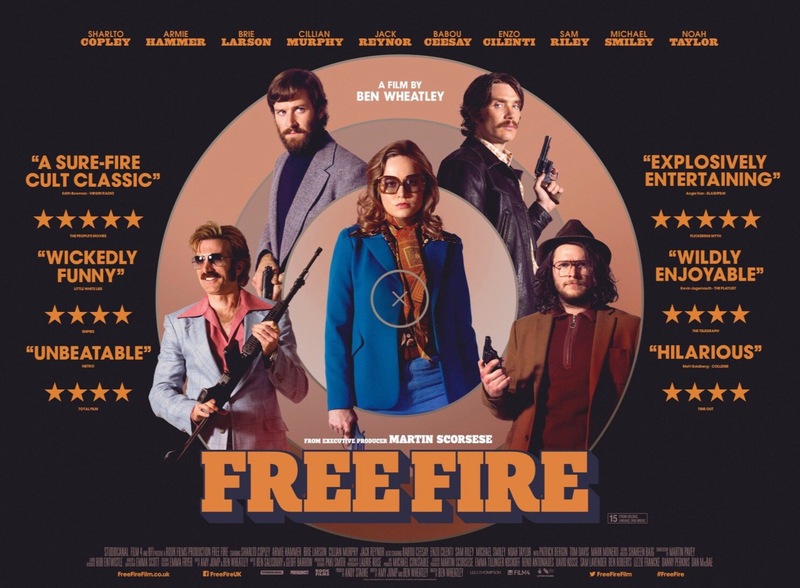 Free Fire is rated 15 and it has a couple of moments to make you wince but it isn’t as intense or disturbing as other films in Wheatley’s back catalogue such as Kill List and High Rise. It’s more violent than those two episodes of Doctor Who he directed though.